Throughout Indian history, many authors and performers have produced, and many patrons have supported, diverse tellings of the story of the exiled prince Rama, who rescues his abducted wife by battling the demon king who has imprisoned her. 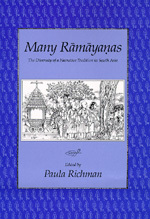 The contributors to this volume focus on these "many" Ramayanas. While most scholars continue to rely on Valmiki's Sanskrit Ramayana as the authoritative version of the tale, the contributors to this volume do not. Their essays demonstrate the multivocal nature of the Ramayana by highlighting its variations according to historical period, political context, regional literary tradition, religious affiliation, intended audience, and genre. Socially marginal groups in Indian society—Telugu women, for example, or Untouchables from Madhya Pradesh—have recast the Rama story to reflect their own views of the world, while in other hands the epic has become the basis for teachings about spiritual liberation or the demand for political separatism. Historians of religion, scholars of South Asia, folklorists, cultural anthropologists—all will find here refreshing perspectives on this tale. Paula Richman is Associate Professor of South Asian Religions at Oberlin College. She is the author of Gender and Religion: On the Complexity of Symbols (Beacon 1986).